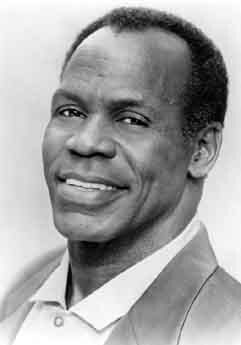 Danny Glover is an American actor, best known for action flicks such as Lethal Weapon 1, 2, 3, and 4, and Silverado. He played Whoopi Goldberg's abusive husband in The Color Purple, and portrayed Nelson Mandela in two different television movies, one for PBS and the other for HBO. In both films, his Winnie was Alfre Woodard. Glover's first film was Clint Eastwood's Escape from Alcatraz in 1979. His breakthrough roles were in Witness and Places in the Heart, both in 1984, playing a crooked cop in the former and a kindly cotton picker in the latter. Glover is also widely known as a progressive political activist, using his celebrity to promote causes he believes in. He has publicly urged South Africa to pay more attention to the AIDS catastrophe there, demanded that Sudan stop its ongoing slaughter of 50,000 citizens, and protested the American invasion and occupation of Iraq. When he signed a petition protesting the American "campaign of destabilization" against Cuba, MSNBC's Joe Scarborough led other offended right-wingers in demanding Glover's firing as pitchman for MCI. The telecommunications giant soon declined to renew Glover's contract. His parents were both active in the NAACP, and Glover has always been politically active. In high school, he became involved in the civil rights and anti-war movements. He worked as an anti-draft counselor during the height of the Vietnam War, lived in a commune for two years, and attended college in San Francisco during the height of the 1960s protests there. As a boy he was dyslexic, and as a young man he suffered from epileptic seizures. Both conditions faded away as Glover reached adulthood.